Globe Corporation is working with the land owner to develop an 84 acre site at the southwest corner of Powers Blvd. and Milton Proby Parkway, El Paso County, CO. 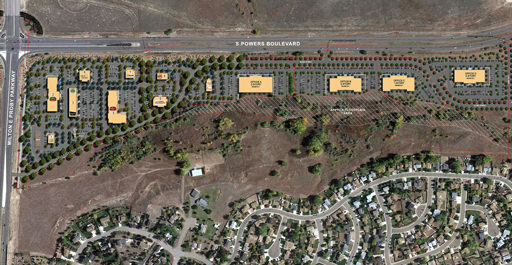 This mixed use development will be the gateway entrance to the Colorado Springs Airport. Phase I will feature two (2) hotel sites, a full service restaurant, a convenience store with gas, several restaurant/bank pads and assorted retail shops. Phase II will incorporate four (4) class “A” office buildings located off Powers Blvd. Current plans have been submitted to the county for preliminary approval. Initial off-site improvements could begin as early as January 2016.